Selam everybody..... Merhaba from Turkey. Do you like baking? Or do you always have some left over egg white on the fridge? That's me. And more especially days starts cold like now days, when I cook creamy soup for warm up our family dinner table, I use mostly yolks on my soup. Check my "soup" category to see our soup menus. And since I always have one or two jars of left over egg white on my fridge,I have many recipe using left over egg whites. Start from macarons and some cakes. Check my zebra steamed cake or other cake recipes using only egg white here. And this angel food cake was on my baking list for sometime. I love baking with matcha/ green tea. Beside the taste which I like, I'm also enjoying during baking time, my house will full of fragrant aroma from the green tea. Not yet mention about it benefit. 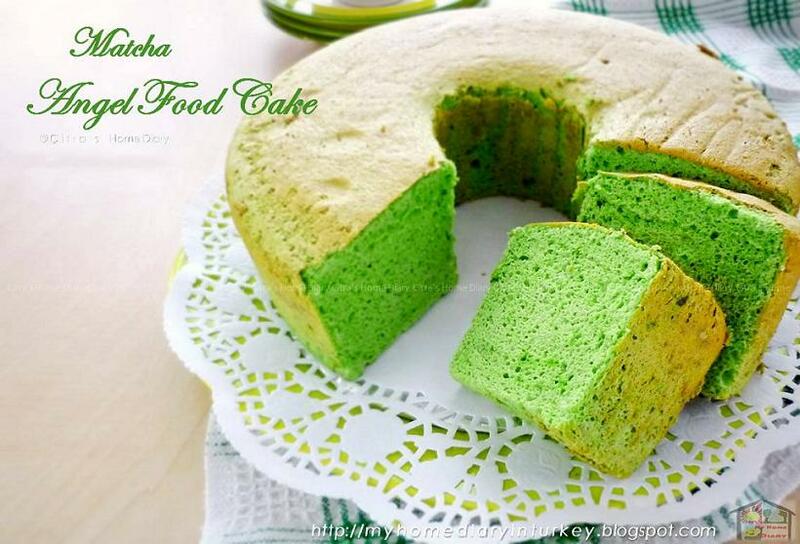 So today I bake Matcha angel food cake for our tea/ coffee time at home. 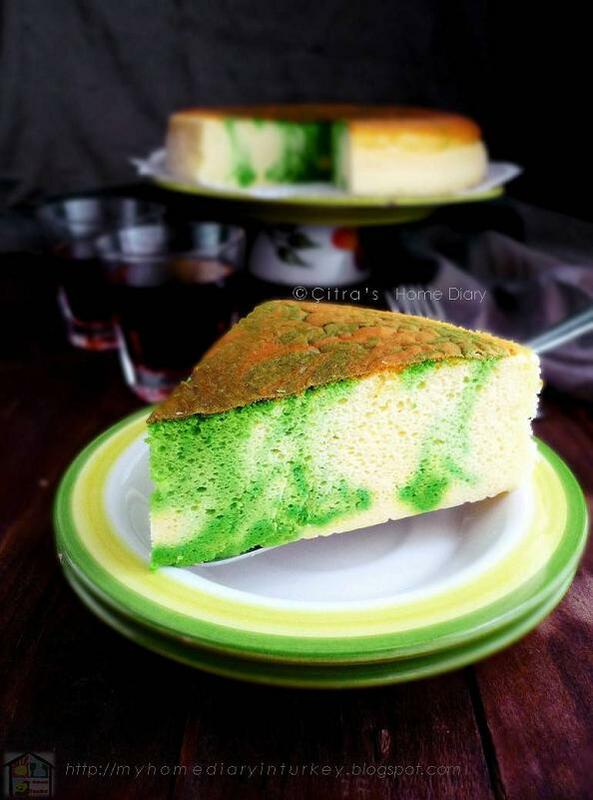 Well... actually I wanna make classic white angel cake, but these days I'm enjoying matcha in any ways, baking or just simple make it latte. Selam everybody... Merhaba from Turkey. LAHMACUN is an item of prepared food originating in the early Turkish cuisine of the Levant, consisting of a round, thin soft piece of dough topped with spicy minced meat (commonly beef and lamb). 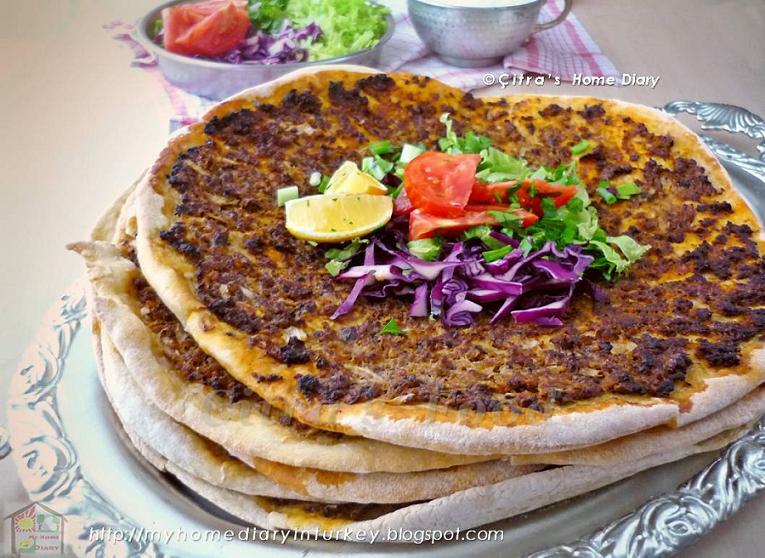 Lahmacun is often served sprinkled with lemon juice and wrapped around vegetables, including pickles, tomatoes, peppers, onions, lettuce, and parsley, cabbage salad or cilantro; a typical variants may be found as wraps for kebab meat or sauces. 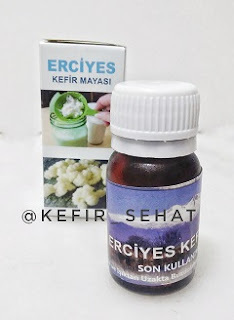 It believed originate from South East of Turkey. The main ingredients are ground meat (beef/ lamb/ mutton), tomatoes, paprika, onion, salça and oil. Salça is thick tomato pasta (mostly homemade product) and prepared just before winter come when the tomato season in peak here in Turkey. But the recipe might be vary from each regions. 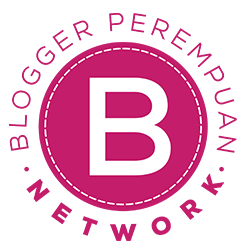 And what I want to share today is how commonly people in Bursa make it although some family from other region using a bit different. But still we all use same main ingredients as I mentioned above. There are two process making this lahmacun, the dough and meat topping. After the dough double in volume, divide the dough into 10 to 15 equal parts. If you want smaller diameter lahmacun divide it into 15. Then roll each part of the dough very thin, verry thin! Then spread evenly with ground meat topping. 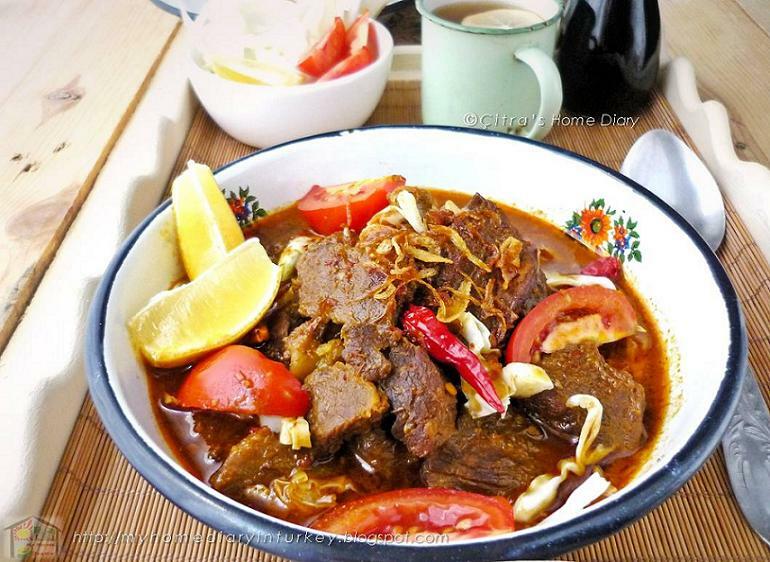 Tongseng is goat meat, mutton or beef stew dish in curry-like soup with cabbage and kecap manis (sweet soy sauce). Tongseng is commonly found in Indonesian region of Central Java; from Surakarta to Yogyakarta. 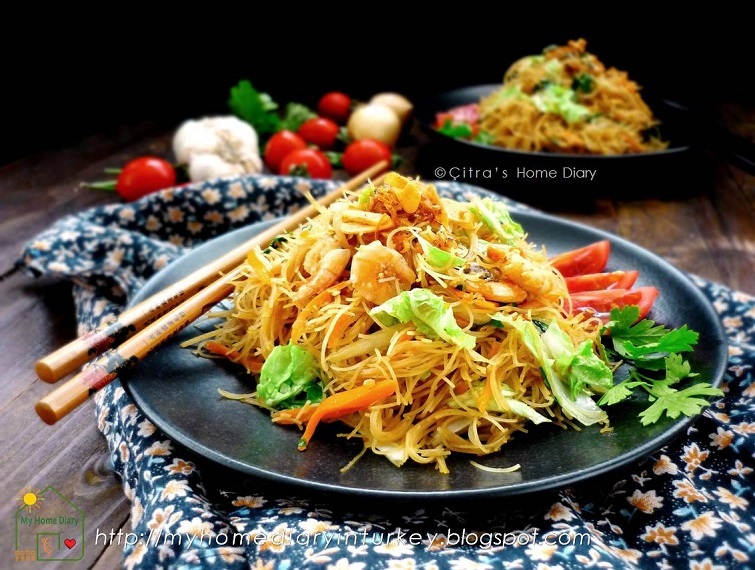 However, it is believed that dish was originated from Klego district in Boyolali, Central Java. Traditionally, tongseng is considered as the merge between satay and gulai. The soup of tongseng is similar to gulai soup, however gulai is cooked without sweet soy sauce while tongseng mostly appears in brownish gold colour because of the addition of sweet soy sauce. Gulai usually uses beef's offal while tongseng usually only uses meat (goat, mutton or beef). Today, tongseng is a common dish in Javanese cities of Boyolali, Surakarta (Solo), Klaten, and Yogyakarta, thus most of tongseng sellers hailed from those towns. 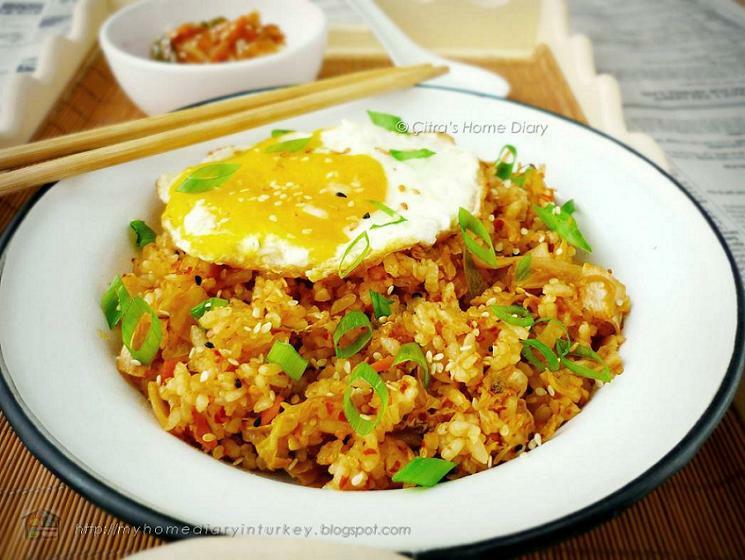 The dish is also can be found in Indonesian major cities, such as Jakarta, Bandung, Semarang and Surabaya. Tongseng sellers usually marketed themselves as Warung Sate Solo, a warung or small modest restaurant that specialized in offering satay, tongseng and gulai as their main fare. Selam everybody.... Merhaba from Turkey. Cheesecake is the most repeatable cake I bake in these 6 years. 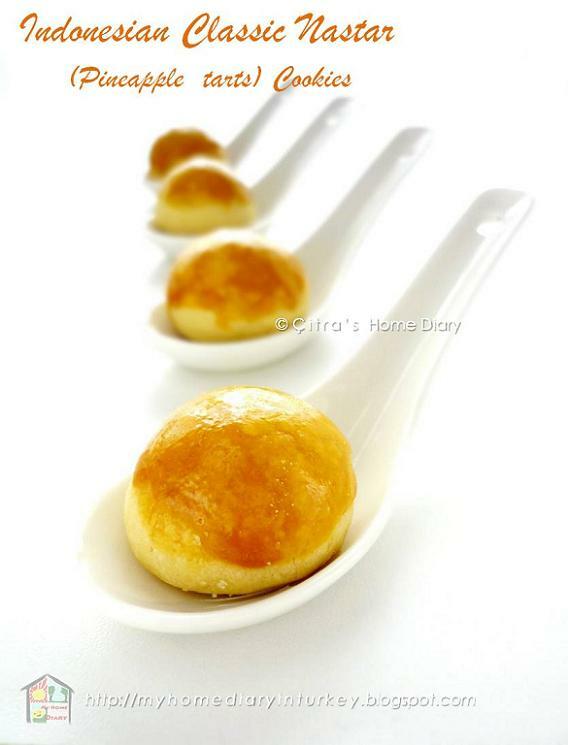 Since I baked first time for my husband at early year our marriage, he fell in love with it. I'm big fan of cheesecake, especially cotton soft one like this Japanese style cheesecake. 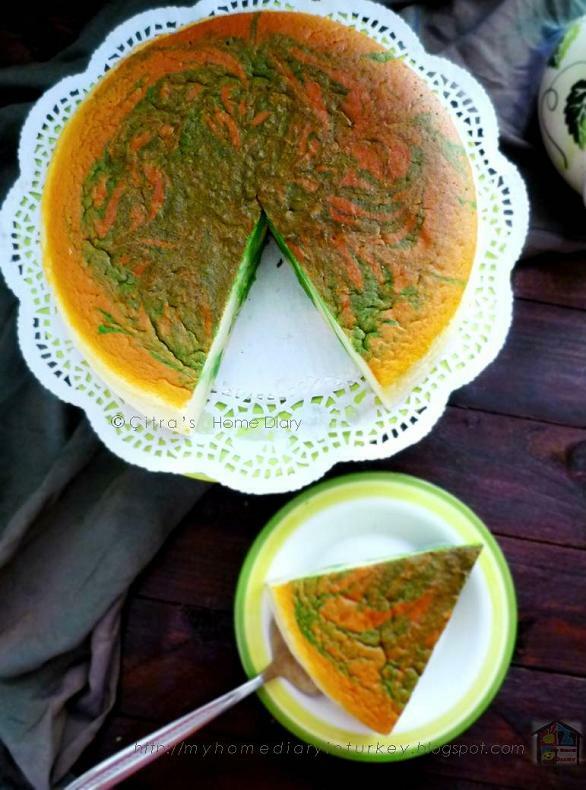 Different from New York style, this cheesecake has very light cottony texture. The topping and can be vary start from lemon curd until your favorite jam. Please do check my other cheesecake posts to see the variation here. And my post today is Japanese cotton light cheesecake with matcha (green tea) marble. The recipe I adapted from Diana Dessert's with minor adjustment using matcha marble. Original recipe using 8" round baking pan, but here I use 9" (about 24 cm in diameter) fixed base pan. Next time I will use 8" for taller cheesecake. Just need to lightly grease and line the side of pan with baking paper/ parchment paper few cm higher than the pan. This time I grease the bottom and side of my 9'' fixed base pan and line with parchment paper. I bake this cheesecake with water bath method as original recipe calls, but I put low and small rack over water bath pan so the bottom of my baking pan barely touch the water. Well.... I pour hot water maybe not more than half cm high from my baking pan's bottom side. See the illustration below. If you use removable pan, it's important to line the outside of pan with double heavy duty aluminum foil, or few sheet thinner aluminum foil to make sure no water seep into your cheesecake during water bath baking. Another note, to prevent sudden change of temperature that may cause the cake to shrink drastically, you should let the cake cold down inside the oven with ajar. But actually It’s normal for Japanese cheesecake that will shrink about ½ inch after cooling, don't be alert. 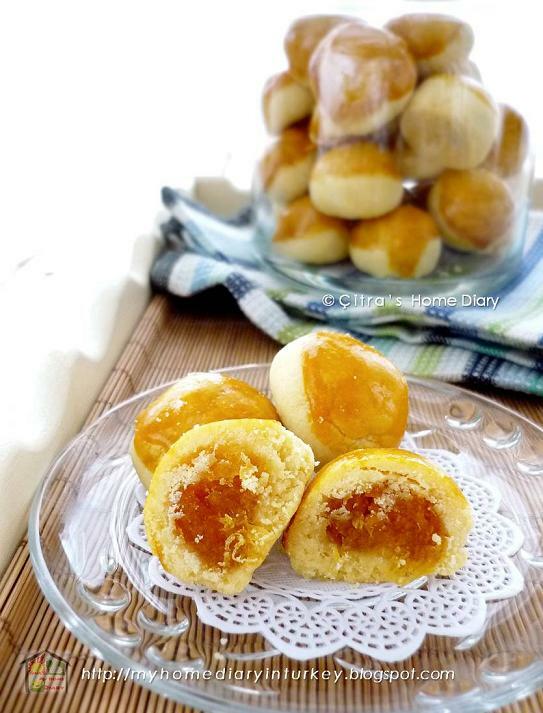 Pineapple tarts cookies is one of Indonesian traditional (and some neighbouring countries) cookies that commonly made and serve during religious holiday such as Eid-el Fitr or christmas along with many other traditional cookies like; kaastengels, putri salju, pastel mini, Butter cokies or simple chocolate cookies and more. 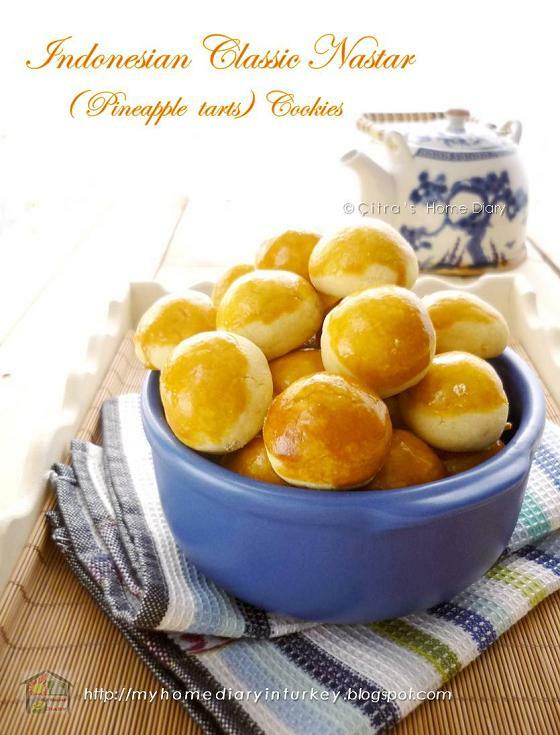 Check other cookies recipe on "COOKIES" category list.